PostNL becomes first fleet in Europe to deploy Master Z.E. 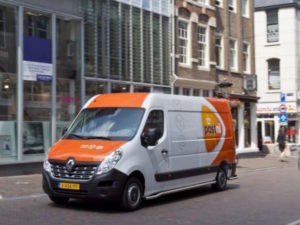 PostNL, a mail, parcel and e-commerce corporation in the Netherlands, has deployed the first two Renault Master Z.E. models built in Europe as it looks to reduce its CO2 emissions. Announced last year, the Master Z.E. marks the first electric version of the Master and marries up a 33kWh Z.E.33 battery with a 76bhp electric motor to tackle ‘last-mile delivery’ needs. PostNL will deploy an overall fleet of 17 Master Z.E. models by the end of the year, which will help it realise its plans for CO2-free deliveries in 25 inner cities by 2025.